‘Like Our Souls Were Shaking Hands’ A grant from the Endeavor Foundation sent Trang Duong '20 and Hannah Denham '20 to Vietnam, where they had enlightening interviews with both men and women about marriage in modern Vietnamese society. Trang Duong ’20 and Hannah Denham ’20 in Vietnam, where they completed a summer project about marriage in modern Vietnamese society. The program, which is funded by part of a $219,000 grant from the Endeavor Foundation (formerly known as the Christian A. Johnson Foundation) is now in its third year. 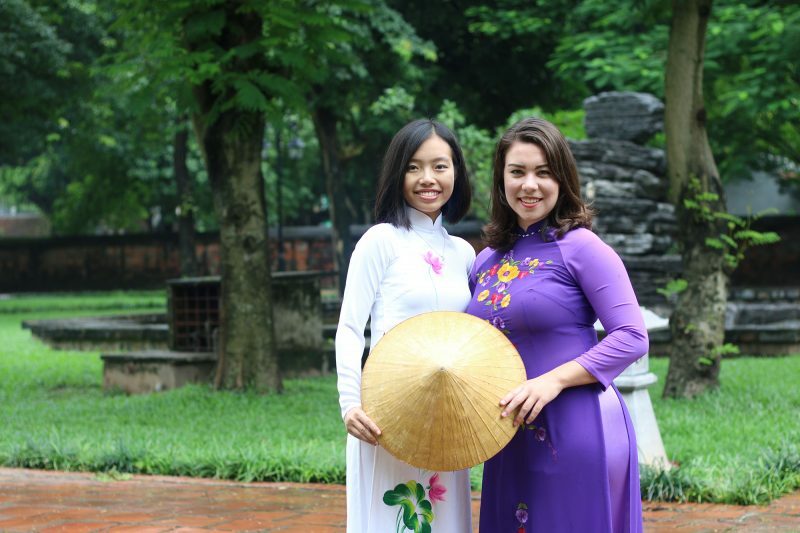 Trang Duong and Hannah Denham, both members of the Class of 2020, traveled to Duong’s home country to study marriage in modern Vietnam. Trang: Our project is about women and marriage in modern Vietnamese society, from the perspective of educated men and women from different generations, and with the focus on young, educated, motivated and single Vietnamese women. We chose this topic because in Vietnam, women are under a lot of pressure from both families, friends and the society to get married at a certain age. Some women even get married so that they don’t have to put up with the pressure anymore. Trang: We interviewed a total of 20 men and women from different generations, but focused on young, educated, motivated, single Vietnamese women. We started the conversation with demographic information, then we talked about their perspectives on happiness and success, as well as their role in their family. Then we introduced the topic of marriage and asked about their opinions on marriage age, reasons to get married, and so on. Trang: We received a variety of answers but it seems to me that people are more open to options besides marriage. People of younger generations today definitely focus more on their careers than people of older generations did when they were around the same age. It concerned me when interviewees talked about people — either themselves or someone they know — getting married without knowing what to expect. What are the most important takeaways from the research to share with the university audience (and beyond), and how do you plan to do that? Trang: We are working on a 20- to 30-minute documentary to show to the university audience on November 3 at 3:30 p.m. at the atrium in the Center for Global Learning. For me, the most important takeaway is the difference in people’s perspectives based on their age. Although women are getting married later now, it seems to me that they are more aware of what to expect in their marriage. It’s amazing to listen to their stories of how they face such pressure from everyone around them. Hannah, what were your impressions of Vietnam after the trip? What I was most excited about leading up to my travels was the fact that I had no idea what to expect of Vietnam: no preconceived notions, no reputation, not even any experience with Vietnamese food. Everything was new, exciting, delicious. I was continually struck by how beautifully diverse the country is. Each place we visited felt like I was transported to a new place. There was never a dull moment. Trang, what was it like introducing your study partner to your homeland? When you saw it through their eyes, what was different about it for you? When I introduced Hanoi, the city where I have spent my whole life, to Hannah, I started looking at it from a “fresher” viewpoint. I still remember the first day, when we passed an open area where people exercised in the morning, I suddenly realized that I’ve never spent even a second to observe all the little but beautiful things of Hanoi. On that day, I just loved my city so much. And although I had been to Ho Chi Minh City a few times before, traveling there with Hannah allowed me to experience the city as a tourist. I don’t know why but the city just became much prettier. Trang: It’s hard for me to choose my favorite experience of the trip because I loved all the conversations we had with the interview subjects. They were so nice and so open to us even though for some of them, it was the first time we have ever met. I love all the stories they told, all the advice they shared and all the enthusiasm they had for our project. People were definitely my favorite aspect of the trip. Hannah: I was so inspired by the women we interviewed. They talked about self-love, carving out their own paths for happiness, overcoming obstacles in their careers, becoming successful, and using their voices for change in their communities and in the people that surround them. I found myself getting lost in the interviews. It felt less like journalism and more like a conversation, like our souls were shaking hands. The best part about hearing these women’s stories is how real they are. They talked about their heartbreaks, obstacles in their family lives, what they learn about themselves from each relationship, platonic and significant. Also, I am so grateful for how immersed I was in Vietnamese culture by living with Trang and her family for the whole month. I feel like I learned so much that way, through challenges beyond the academic level that pushed me out of my American comfort zone and state of mind. Trang: This project has enriched my understanding in real life, and allowed me to apply some skills I learned from W&L into real-life experience, from forming questions for the conversation, networking, etc. Through this project, I learned how to view from other people’s perspectives and be open-minded when discussing topics about which I already had firm beliefs. Hannah: It is so affirming to do what I love by sharing people’s stories and to then gain so much from them. The opportunity to combine both my fields of study – journalism and women, gender and sexuality studies – while traveling, as well as having full agency over my creativity and project with Trang, was a complete dream.